Happy Gandhi Jayanti Celebration in Schools 2nd October 2019: Father of the Nation - Mahatma Gandhi, the ‘Father of the Nation’ was one of the most important leaders of India. He was considered to be one of the greatest leaders of the world in the 20th Century. He was the only reason behind the Independent India for which he had put a lot of efforts and struggled for the freedom of India from the British rule. The two unique weapons he used for this war were ‘Satya’ (truth) and ‘Ahinsa’ (non-violence). Mahatma Gandhi’s birth name is Mohandas Karamchand Gandhi. He was born on 2nd October, 1869 at Porbandar, Gujarat. In India, 2nd October is observed as Gandhi Jayanti commemorating the tireless struggle Gandhiji had done for the independence of India. The day is considered as one of the most important historical occasions in India. Gandhiji is called as ‘Bapu’ by the Indians with affection and love. Gandhiji’s father was a Dewan of the Rajkot state. Gandhiji, after his junior college studies went to England for studying Law in 1887. Thereafter, 1983 he went to South Africa, where he was dismayed by the ridiculous condition of colored people and the discrimination that took place by the British against the Indians and South Africans. Mahatma Gandhi couldn’t bear seeing this and fought for their rights. He decided to adopt a new method to implement to peacefully resist the racial discrimination. He always used to believe in truth and non-violence, which then became his unique weapons; Satyagraha and Ahinsa, for fighting against the British people. After he won the battle in South Africa, Gandhiji returned to his motherland in 1916. He now had a dream for his country to make it an independent one from the British rulers. He wanted his nation to be a self-reliant and a self-directed one and so, Non-violence and Non-cooperation movements were then started by him to achieve his aims. He took a lot of people with him for the fight against the British rulers, for which he was many times jailed with other leaders. The British had realized that they won’t be able to continue ruling in India. The rulers went helpless controlling the fire of Independence burning in the hearts and minds of the Indians as there were millions who were following Mahatma Gandhi’s path. In August 1947, the Britishers decided to move backward and then, on 15th August, 1947, India was declared as a free country. How the Celebrations of Gandhi Jayanti? Gandhi Jayanti is one of the three official national holidays of India, and is observed in all the states and Union Territories as well. On this day, Government offices, banks, schools, colleges, companies, etc. all remain closed for the whole day. The day is celebrated with lot of preparations and enthusiasm. Prayer services are arranged all over India in order to pay homage and tribute to the great leader on his birth anniversary. Special arrangements for the same are made at the place Gandhiji was cremated after his death on 30th January, 1948, at Rajghat, New Delhi. On 15th June, 2007, the United Nations General Assembly decided to celebrate 2nd October as the International Non-Violence Day. Prayer meetings, commemorative ceremonial programs, speeches about the teachings of Mahatma Gandhi, are the common activities for this day. Some colleges and local institutions organize painting and essay competitions for the children, for which the best ones are awarded. The themes generally observed for these competitions are non-violence, glorifying peace and Gandhiji’s efforts for the Independent India. Some institutes and schools even arrange speech recitation and quiz competitions related to the same themes which commemorate Bapuji’s struggle and sacrifice towards the freedom of India. The most common of all the activities carried out in his memory is singing the most favorite bhajan of Mahatma Gandhi, ‘Raghupati Raghav Rajaram’. Gandhiji had a natural love for ‘truth’ and ‘duty’. Even today his teachings are alive that help us to stay away from violence and find out solutions for conflicts peacefully. 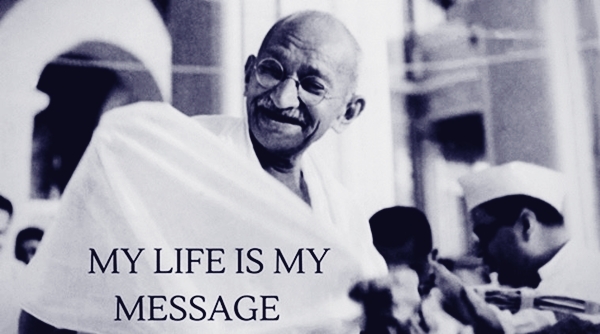 Truth and Non-Violence were the entire philosophy of his life. He had inculcated in himself simplicity throughout his life and also encouraged people to follow the same. On the day of his birth anniversary, the Indian President and Prime Minister pay homage to Mahatma Gandhi at Rajghat, New Delhi. Many other political leaders are also present over there in order to pay tribute to this Great Leader. People from different religions, as representatives, take part in the prayer meetings held at the Rajghat. Bapuji, as called by most of the Indians, was always against smoking and drinking alcohol. Hence, the selling of alcohol is strictly banned by the Indian Government on Gandhi Jayanti. He has been a role model and an inspirational leader for many political leaders and especially for the youths of the country, India. Some international political leaders like Nelson Mandela, James Lawson, were very much inspired by the non-violence theory of Mahatma Gandhi and the way he fought peacefully for the freedom and liberty of his Mother India. They also praise him for the struggle he made for taking off the discrimination that took place against the South Africans. Some of his important works towards his nation include achieving Swaraj, removing untouchability from the society, eradication of other social evils, improvising the farmers’ economic conditions, empowering women rights, etc. In 1920, he had run a movement called the Non-cooperative movement. Dandi March, which is popularly known as the Salt Satyagraha was carried out by him in 1930. He also led the Quit India Movement to help getting freedom to the Indians. The results of this movement were the Britishers left India forever and India was set free from the British Empire forever. The struggle Mahatma Gandhi made in order to achieve an Independent India are unforgettable. He played a very significant role for the betterment of his Mother India and we pay tribute every year by remembering him and his works on his birth anniversary which is known as Gandhi Jayanti.